Yeah, I know, it’s crazy. Why am I even doing this? You can just walk into a colmado and buy salami. It makes no sense. This is not the first time I’ve tackled a recipe that seems to make little sense to us here on the island. Who needs to make casabe at home? Or gofio? Or longaniza? Or, heaven forfend, salami?! Why would anyone want to know how to make Dominican salami? If you live in la tierrita, or any of those places with a gazillion Dominicans, this is probably not for you — though I suggest you keep reading — but you’ll be surprised how many times people have asked us to come up with a recipe for homemade salami and those other staples that many can just walk into a colmado — or bodega — and buy. Not everybody has those at hand. So what do you do when one day you wake up, and nostalgia just punches you in the stomach, and you crave some of the simple pleasures of the homeland? Have you been there? This is a reality for many of our readers. And we get it, which explains why I spent a whole month testing this recipe, taking notes, pictures, and redoing it over and over. I got the flavor right the first time, but the texture didn’t work for me so I spent many hours and a lot of food trying new ideas. There was another reason: Let’s face it, salami (also known as salchichón) has a very spotty reputation. Not a year goes by when it doesn’t hit the news, and not for the right reasons. In 14 years I’ve only bought it a few times, every time to develop recipes for our blog. But I know I am privileged in that I can choose not to eat it — though I admit it is pretty darn tasty. 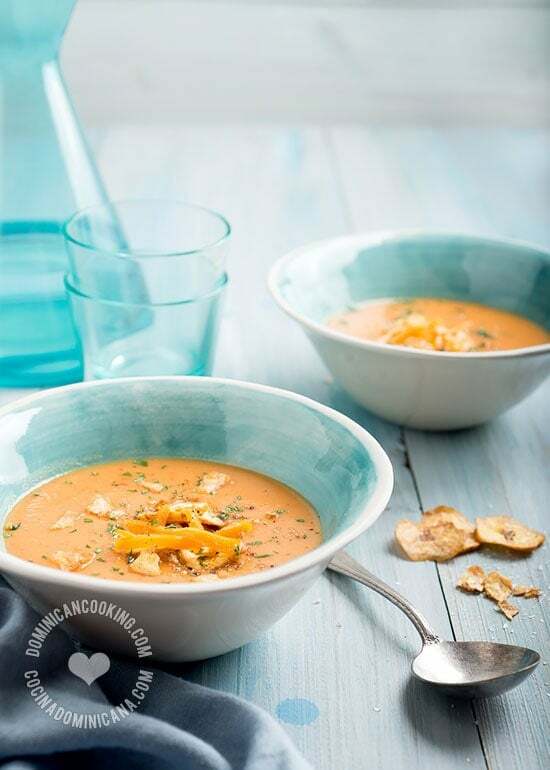 For many a Dominican this is not a matter of taste, it’s just a very inexpensive source of protein, a quick solution to the morning breakfast, or the day’s dinner. Yet even those who buy salami because they can barely afford nothing else will joke about it. You know what I am talking about. Let me make something clear: this Homemade Dominican Salami isn’t anywhere as cheap as the real thing. And while it may not have any preservatives, and we can be sure what went into it, it is by no means a healthy choice. That much should be obvious. What it is is very tasty. The flavors are very, very close to the real thing, and the texture is reasonably close. Make it because you are curious. Make it because you miss the store-bought kind but can’t find it. Make it because you’d prefer to know what’s in your food. Make it because it is actually fun to do this. Just please don’t complain that it isn’t exactly like the one you bought at the colmado. Cause it isn’t. And I am fine with that. 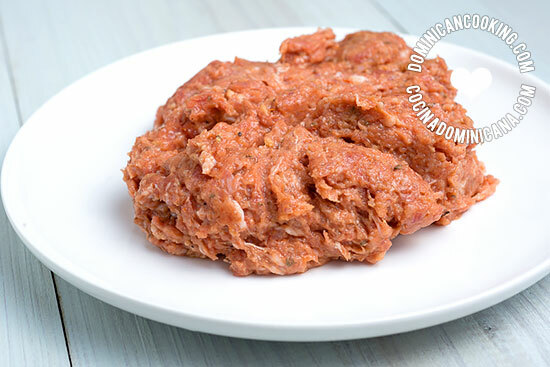 Homemade Dominican Salami Recipe: Ever wondered if you could make salami at home? I just found a way myself. The flavor and texture is close to the real deal, but made with better, safer ingredients. 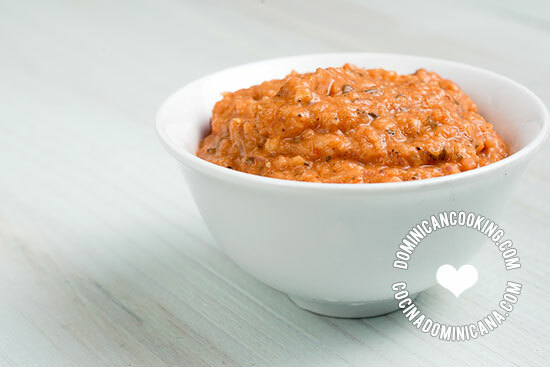 Place onion, garlic, oregano, pepper, salt, tomato paste, and flour in the food processor. Pulse until you obtain a coarse paste. Set aside. Place the minced beef in the food processor and pulse for two minutes, by then the meat would have turned into a smooth paste. Add in eggs, bacon and the seasoning paste. Pulse until the bacon is chopped finely. Remove from the processor and place in a bowl. Cover with plastic film and chill for two hours. Roll a very large piece of plastic wrap (about 1 yard [1 m]), and lay flat on the countertop. Place the meat mixture on it and form a log. Wrap in the film, rolling until the end, leaving at least two inches at the ends. Tie the ends with a knot (or using an oven-safe tie-wrap). Return to the fridge. In the meantime, fill a large pot with 1 gallon [4 lt] of water. Heat over medium-low heat until it reaches a gentle boil (there's bubbles rising from the bottom of the pot). Lower heat to minimum (see notes). 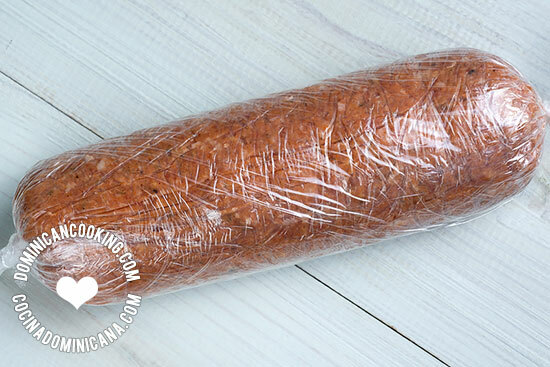 Place the meat log into a watertight, oven-safe plastic zipper bag, squeeze all the air out before zipping closed. Place in the pot with the boiling water. Cover and cook for 45 minutes. Remove the salami from the pot and cool to room temperature. Chill. You can serve fried, or make into a hot pot. Slice or cut while still cold. Make sure you cook it over very low heat, just enough to see bubbles rising from the bottom of the pot. You do not want the plastic to melt, it may be food safe, but not edible. The salami is not as perfectly round as the store-bought kind, but I got my logs pretty round and even. It is also not as compact as the industrial kind. I had to be a bit careful when cutting and manipulating. There is no preservatives in this (other than salt and seasonings), so observe the same storage guidelines as any other cooked meat. You can also cut it into slices and divide into serving sizes and freeze for later use. You can probably find them at a large supermarket. Te quedaria mucho mejor si utilisas carne de cardo envez, y que tenga su grasa. Suena interesante esa opción. Quizá la pruebe alguna vez. I was introduced to this delicious item by a lovely Dominican lady in Puerto Rico who was kind enough to give me a massive roll to take home with me. It’s nearly run out. So to find this is a lifesaver. Will be trying very soon, thanks a bunch! I’m so happy to see a recipe & topic on Dominican salami. I grew up on salami & love all kinds. Every salami I had except Dominican salami has been cured with wine or vinegar or both with other ingredients usually spices. It’s always hard & can be eaten with out cooking. My question is, is Dominican salami really a salami or more of a sausage? I always found the texture and flavor more of bologne. I ask this question because I love to find out facts about food and why culture’s change names and recipes.